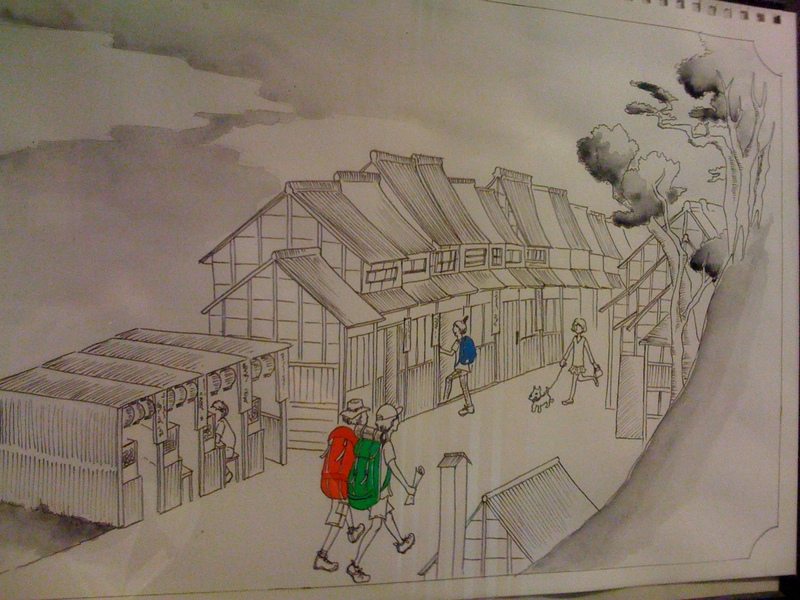 tokaido road | JAPAN THIS! Need a Cheap Place to Stay in Tokyo? How the place looked during it's first week open! My friend Taka asked me to come down and stay one night to give him an outsider’s opinion of the place. Since I love Japanese History, I was already pretty familiar with the area. Guesthouse Shinagawa-shuku is located in historical Shinagawa. These days, most of Shinagawa is ultra-modern, but the Shinagawa-shuku area is still a very traditional, old school Japanese neighborhood dating back to late 1500’s. It’s one of my favorite areas in Tōkyō! a cute painting hanging in the hallway which borrows from the original famous painting of shinagawa-shuku (shown above). The rooms are Japanese Style (traditional tatami floor and a futon with Japanese bedding). 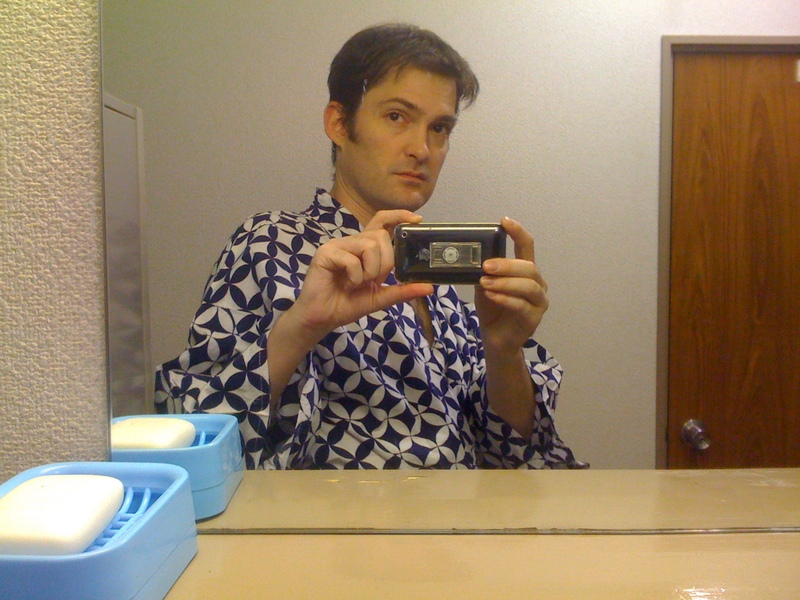 If you want a yukata (a light summertime kimono also used as pajamas), you can get one – which, of course, I did. I stayed alone, so I chose one of the private singles (the smallest room type). But it was more than enough for me. All the rooms have free wi-fi so i was good to go with my laptop. i played yo-ville in my room. There is a traditional Japanese style public bath (one for men and one for women). The japanese looooove taking long relaxing baths and I’ve learned to enjoy them too. So I drew up a piping hot bath, opened a frosty can o’ beer and just chilled for an hour in the bath. Awwwwww yeah. after i took a bath i took a cheeseball pic of myself. oh the things i'll do help friends save money in japan. lol. If I moved back to the US and then came back to visit Tōkyō, I’d definitely stay here just for the bath. But also, a crappy business hotel that smells like an ashtray starts at about $80-$90 a night. A real hotel is going to be around $120-and up. I’d rather spend my money on food and shopping and sight seeing and girls. So, $30 a night seals the deal. Seriously. 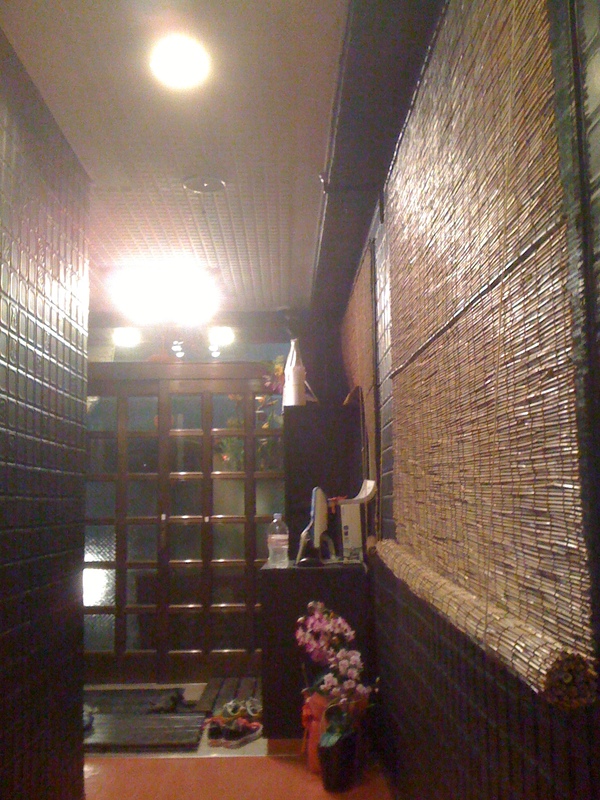 yaki tori place that I highly recommend. Next to that is a well stocked convenience store with anything you need 24 hours. 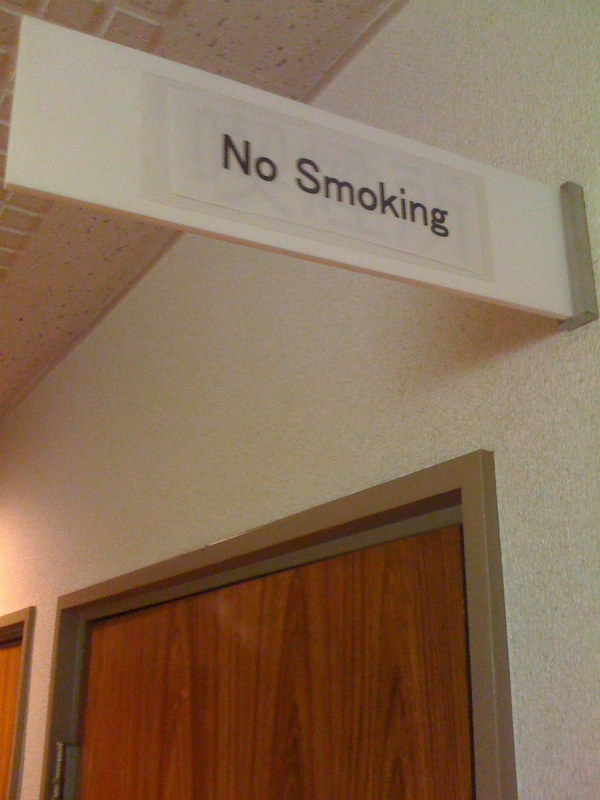 the entire building is non-smoking. but smokers can kick it on the roof top or mingle with passers by on the streets. Shinagawa-shuku is a 2 minute walk from Kita-Shinagawa Station. From the larger Shinagawa Station, it’s a 10 minute walk (which happens to pass by one of the most famous rāmen shops in Tōkyō – and IMO one of the best 3 in the entire country). As a major hub station, some of the most important train lines stop here. The Yamanote Line (which makes a loop around all of Tōkyō), the Keihin-Tōhōku Line, the Tōkaidō Line (which gives you access to Yokohama and the beautiful Kamakura). I forget some of the other lines, but also one of the most important Shinkansen lines (bullet train) originates here. This train will take you along the Tōkaidō from Tōkyō to Kyōto/Ōsaka in 2 hours. Woohoo! Also, you can get Narita and Haneda airports from here. 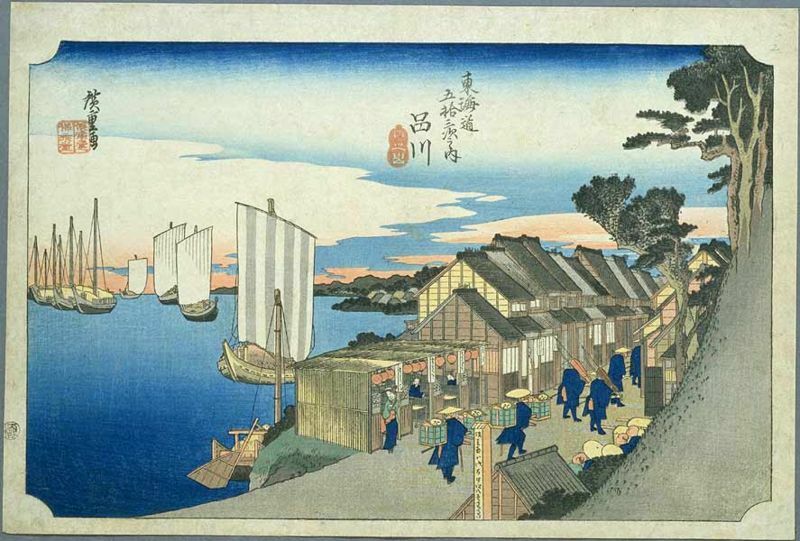 In the Edo Period (1600-1868), the main road connecting Edo and Kyōto was the Tōkaidō (literally, “eastern sea road”). Along the way, there were postal towns where travel permits were checked and travelers could stay overnight and get something to eat. One of the most famous postal towns on the old Tōkaidō was the very first station… which was Shinagawa-shuku (by the way, “shuku” is what that kind of postal town/inn town is called in Japanese, so you can find many towns with “-shuku” in their name to this day). As a result, the town has a really historical feel which the locals are proud of. You can find traditional shops making tatami floors, incense shops, rice shops and loads of traditional Japanese sweets! All the food in this area is really good! There are tons of small mom and pop restaurants selling traditional Japanese food. There’s also a sushi shop that was visited by the 3rd shōgun and still bears the shōgunal family crest. 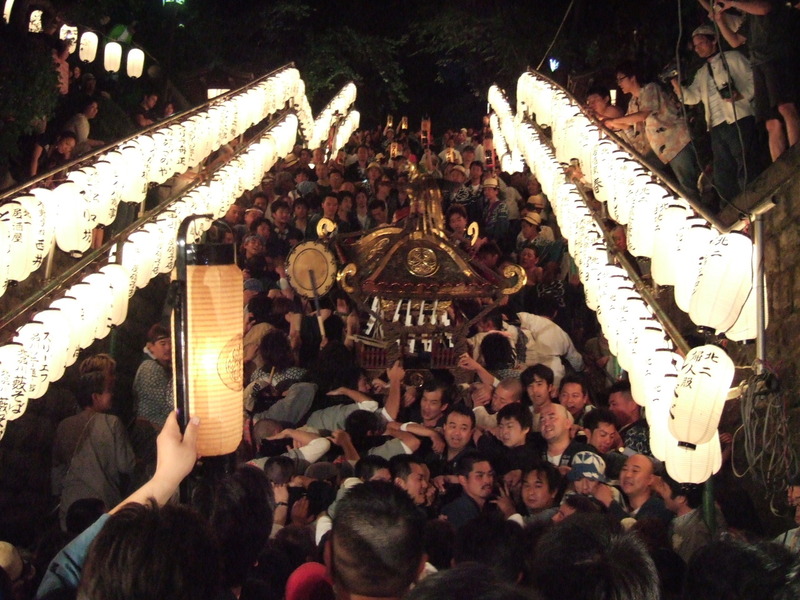 The area is teeming with temples and shrines. Who can’t use a little good luck? lol. The Shinagawa-shuku provides a bunch of maps with glossaries and explanations of all the historical spots. There are WELL OVER 100 clearly marked points of interest in the area, which is too many for me to mention. You can also see the remains of one of the 3 execution grounds from the Edo Period which is said to be the most haunted place in Tōkyō (Suzugamori Shikeijo). And Shinagawa Jinja is a beautiful shrine far up on a hill that represents a ritual pilgrimage to the top of Mount Fuji. Oh, i can’t forget Sengakuji, the temple where the 47 samurai who committed ritual suicide as the result of a heroic catch-22 situation are enshrined – one of the most famous (and complicated) stories of true samurai loyalty. It literally translates as “downtown,” but that’s not really what it means. You should think of it as “Old Style Tōkyō” or even “Edo” (the name of Tōkyō until about 1869). Many families have lived here since the samurai days, so people have a different culture than mainstream Tōkyō, which is a sprawling megacity and home to people from all over Japan. Japanese people are by nature a little shy around foreigners because of the language barrier or, in the case of this area, due to limited exposure to them. But if you can speak Japanese, tho, you’ll find shitamachi people have the biggest hearts in Tōkyō. They’re talkative, gregarious and love to tell stories — especially the old people! If you know a few words – even “please,” “thank you,” or “delicious,” try them out and you’ll get big smiles and probably lots of questions about where you’re from, what do like about Japan, etc. Even if they seem indifferent at first, try engaging the locals you’ll be surprised how friendly shitamachi people are after you break the ice! As for me, I like to kick it local style everywhere I go. I want to meet local people, learn local stories and try to understand a country’s culture deeply.